Windows in time. They say that life is made up of moments, which sharpen your senses and reinforce your sight. All comes together, and you realize how fortunate you are to be in the moment, and recognize it for what it is. This is the feeling that overcomes you sitting on Mamma Agata's terrace, high up in the clouds in a jewel of a small Italian town called Ravello. Water surrounds your view and the air is like white gold. On the table before you are numerous little dishes holding secrets that taste like treasures. You can't stop eating everything, in between the stories and colour that make up the conversation. She prepares a meal with both the love and respect that it commands. She has been cooking most of her life; since her teenage years in the nearby summer villa of a wealthy American woman, who had entertained many illustrious personalities in the 50's 60's. They called her "Baby Agata", since she was so young but dedicated to her craft. Either cooking for a large gathering or an impromptu poolside lunch, the approach was always the same. Traditional dishes with regional ingredients replaced formal ones and Mamma Agata always remembered her guests' favourites. When Fred Astaire came to call, after a lunch of spaghetti alla puttanesca, he would waltz the hostess's elderly mother around the courtyard. Humphrey Bogart was more reserved, and quietly ate his alici fritti while taking in the view. The pasta e fagioli was a dish exclusively reserved for Anita Eckberg, a gloriously tall woman with skin like milk. But, my favourite memory that Mamma Agata shared with me is that of Jacqueline Kennedy, who impressed her with "un eleganza molto simplice" an elegant simplicity that was unique only to her, enjoying mozzarella and tomato salad beside the pool. 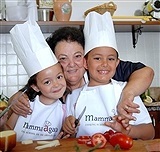 In the last 14 years, Gennaro has joined in the kitchen and cooks side-by-side with Mamma Agata every day and each of them are such great cooks and although they have different techniques, they both reach the most amazing results - delicious food with wonderful flavours and Simple and Genuine cooking, of course! Gennaro is not only a great cook but also a Professionally Certified Sommelier and a member of AIS (International Sommelier Association),which is the official Italian organisation that recognizes highly acclaimed sommeliers throughout Italy. Membership in this prestigious club is difficult to obtain and boasts some of the best wine connoisseurs in the world. In addition to being a certified sommelier, Gennaro is also a professional cheese taster, known in Italy as a "Maestro degustatore di formaggio". To gain this highly acclaimed status, Gennaro studied and tasted hundreds of cheeses and he is now ready and waiting to share this vast knowledge with you and your friends in this once in a lifetime experience. If Mamma Agata is the soul of the family, Chiara is the heart. She is the lifeblood, maintaining the "heartbeat' of the household to ensure all parts work harmoniously. Through love and encouragement, Chiara constantly nourishes and provides support. Elegant simplicity! These words are exactly the way in which Mamma Agata and Gennaro prepares and shares a meal at table . Bring the flavours of Mamma Agata into your house... Do not miss out Mamma Agata Products as a special present or to simply treat yourself! We ship all over the World and we will be happy to customize your order! Please, for additional information, send us an email at info@mammaagata.com!